Spectrum Surgical extends its surgical instrument line to the Spectrum Clean-Wave™ Kerrison Rongeur. 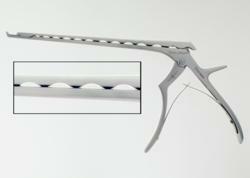 Spectrum Surgical Instruments Corporation is pleased to introduce the Clean-Wave™ Kerrison Rongeur. These German engineered Rongeurs employ a unique, waveform shaft design that allows bioburden to rinse away easily without time-consuming disassembly. This lightweight, smooth-sliding, breathable design allows for safe, efficient processing. Most importantly, the design of the Clean-Wave™ Rongeur provides full visual and mechanical validation. Manufactured in Germany with a lifetime guarantee, Spectrum’s Clean-Wave™ Kerrison Rongeurs come in a variety of jaw widths, lengths and orientations. For more surgical instrument information, please contact a Spectrum Customer Care Representative at 800-444-5644. Spectrum Surgical Instruments has been providing a full line of surgical instruments for Human and Animal health since 1983. Spectrum is a leading provider of surgical instrument repair, sharpening and restoration. Spectrum Surgical provides surgical equipment to surgery centers and veterinary centers across the United States. "We have taken a leading role in the industry by providing free educational services about surgical instrument care. The goal is to educate those who come in contact with surgical instruments to ensure that all are aware of the impact they have on patient safety. Our commitment to quality has led us to increase our quality systems and improvement initiatives. We work directly with customers and industry leaders to offer technology, preventative maintenance, and quality products designed to improve patient safety."